Held at the Pennsylvania Convention Center in Philadelphia, this year's conference promises to be an unforgettable one. Attractions such as The DemoZones, Lab Gauntlets, NEXUS Theaters and the Pittcon Park, are but a few of the features waiting attendees this year. With all the hype around Pittcon 2019, SiliCycle felt necessary to underline the importance of Pittcon's 70th anniversary and to give respect due in this spotlight article. Ever since the first conference, February 17th 1950, Pittcon has seen its reputation grow along with its contribution to the laboratory science world. Back then, the event had been held at Pittsburgh's William Penn Hotel. The exhibits, featuring 14 companies, were housed in the 17th floor hotel ballroom. Whereas the first Pittsburgh Conference provided 56 speakers an opportunity to give presentations in the areas of analytical chemistry and applied spectroscopy, the current Pittcon technical program provides over 2,000 speakers an opportunity to address sub-disciplinary topics from biomedical to the food industry, to nano-materials going through green chemistry. Pittcon's technical program has become the place for anyone who identifies, quantifies, analyzes or tests the chemical or biological properties of compounds or molecules, or who manages these laboratory scientists. Without a doubt, education and innovation are at the heart of Pittcon. Its first mission is to sponsor and sustain educational and charitable activities for the advancement and benefit of scientific endeavor. "As a non-profit organization", one spokesperson says, "Pittcon has been able to donate roughly $1,000,000 to support science education and science outreach each year. Additionally, a goal of the annual Pittcon event is to highlight the latest and greatest innovations from leading companies." 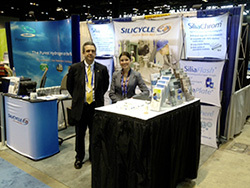 Since its first year of existence, SiliCycle has been a proud participant in every Pittcon conference & expo. Back then, SiliCycle was a humble startup, years away from becoming the multimillion-dollar profit enterprise praised by Canadian Premiere Justin Trudeau. In January of 2019, while promoting new markets at an event hosted by Québec City's chamber of commerce and industry, Premier Trudeau stated that SiliCycle's "pharmaceutical products are now used to develop new medications". He then went on to add that "SiliCycle has 1500 clients in 85 countries around the world" as an example on how insure a long-term prosperity for the Canadian economy. This year at Pittcon, SiliCycle will showcase its variety of products and services (such as EPAK® flow-through purification cartridges). The biggest news for the company is undoubtedly the development of new products in connection with the $15M and 21,000 sqft expansion. This new construction will not only allow SiliCycle to increase production capacity of currently marketed products, but will also enable SiliCycle to offer its 20+ years of expertise for the production of plant, forest and marine biomass extracts via a state-of-the-art Extraction-Purification technology platform. A new product that SiliCycle will reveal this year are SiliaFast™ FaPEx® cartridges, a patented technology developed for ultra-fast sample preparation for pesticide analysis. "The FaPEx methodology is based on the same principles than the QuEChERS method, while simplifying it to the extreme", mentions Adrian Villanueva, account manager at SiliCycle for Latin America & USA. Furthermore, he says that the "product has a real potential to revolutionize how pesticide sample preparation is done in a huge scale, and I'm looking forward to let customers test it." When asked about what is on the menu for SiliCycle at Pittcon this year, Villanueva says that he hopes to meet "as many of our current distributors and partners as possible and to discuss how things are going in their territories and help them to promote our brand." In closing, he adds that SiliCycle would like to "develop distributors in certain territories, in my case for Latin America would be Uruguay and the Dominican Republic". Off the record, we should mention that Adrian Villanueva told us that he's certain he will have a great time at Pittcon 2019. Pittcon 2019 announces to be yet another memorable conference. Highlights of the event include the Wallace H. Coulter Lecture by Nobel Laureate Fraser Stoddart, and Plenary Lecture by Dr. Fenella France from the Library of Congress. The Technical Program will also feature 10 Awards Symposia where Pittcon will honor 14 individuals for their achievements in analytical chemistry and applied spectroscopy. As always, the expo hall features the leading instrument companies from around the world. The future for Pittcon looks promising. In fact, planning for Pittcon 2020 has already begun. As we speak, a dedicated staff and a volunteer organizing committee of approximately 100 individuals are busy at work. Organizers say that they "hope Pittcon continues to foster education and innovation. In order to do this, we were told that Pittcon will continue to provide a high-caliber Technical Program, professional quality Short Courses, countless networking opportunities, and an engaging and bustling exhibition hall". In closing, we would definitely like to invite you to make your way to the Pennsylvania Convention Center in Philadelphia on March 17th to 21st. The great people and organizers, along with Dr. Pete Conn (sporting a new hairdo), look forward to greet the laboratory science community from across the world. For more information about Pittcon 2019, visit the website pittcon.org for all of the details.